Der Inhalt dieser Website ist urheberrechtlich geschützt. Die Bereitstellung von Inhalten und Bildmaterial dieser Website auf anderen Websites oder die Verwendung von Inhalten und Bildmaterial für andere Zwecke ist nur mit ausdrücklicher Genehmigung von CIRCLE - Association for International Cooperation and Development gestattet. Die auf dieser Website enthaltenen Angaben werden nach bestem Wissen erstellt und mit großer Sorgfalt auf ihre Richtigkeit überprüft. Trotzdem sind inhaltliche und sachliche Fehler nicht vollständig auszuschließen. Der Websitebetreiber übernimmt keinerlei Garantie und Haftung für die Richtigkeit, Aktualität und Vollständigkeit der bereitgestellten Informationen. Alle Angaben sind ohne Gewähr. Trotz sorgfältiger inhaltlicher Kontrolle übernimmt CIRCLE - Association for International Cooperation and Development keine Haftung für die Inhalte externer Links. Für den Inhalt der verlinkten Seiten sind ausschließlich deren Betreiber verantwortlich. Sämtliche Fotos, die auf der Website Verwendung finden, wurden von den Circle-Mitgliedern erstellt oder der Vereinigung kostenlos und zur freien Verwendung zur Verfügung gestellt. Information gemäß Art. 13 des Gesetzesvertretenden Dekretes Nr. 196/2003 - "Datenschutzkodex". Wir informieren Sie, dass das Gesetzesvertretende Dekret Nr. 196 vom 30. Juni 2003 den Schutz der persönlichen Daten von Personen und anderen Rechtsträgern vorsieht. Laut zitiertem Gesetzesvertretenden Dekret wird die Verarbeitung der persönlichen Daten nach den Prinzipien der Korrektheit, Gesetzlichkeit, Transparenz, Vertraulichkeit und im Schutze persönlicher Rechte vorgenommen. Tutti i contenuti di questo sito, dai testi alle immagini, sono tutelati da diritto d’autore e non possono essere utilizzati dai visitatori a scopi esclusivamente personali. Ogni utilizzo come la riproduzione sotto diverse forme, il trasferimento ad altri siti, la diffusione attraverso qualsiasi altro mezzo sono consentiti solo previa autorizzazione da parte di CIRCLE - Association for International Cooperation and Development. Le informazioni contenute vengono scrupolosamente controllate. Non si possono tuttavia escludere completamente errori di contenuto. Il gestore del sito non si assume alcuna responsabilità relativamente alla correttezza, all’aggiornamento e alla completezza delle informazioni contenute. Informazioni con beneficio di inventario. 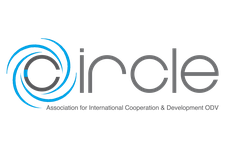 CIRCLE - Association for International Cooperation and Development non si assume alcuna responsabilità per i contenuti dei siti ai quali questo sito rimanda con un collegamento ipertestuale. Informazioni con riserva di modifica. Le foto e le immagini del sito sono state fatte dai membri di Circle oppure messe a disposizione gratuitamente da terzi. Informativa ex art. 13 decreto legislativo 196/2003 - clienti e fornitori per soli fini contabili e contrattuali Bolzano 14/05/2007. Desideriamo informarVi che il decreto legislativo n. 196 del 30 giugno 2003 ("Codice in materia di protezione dei dati personali") prevede la tutela delle persone e di altri soggetti rispetto al trattamento dei dati personali. Secondo la normativa indicata, tale trattamento sarà improntato ai principi di correttezza, liceità e trasparenza e di tutela della Vostra riservatezza e dei Vostri diritti. The content of this website is protected by copyright law. The use of any content and pictures on this website, on other websites or for any other purpose shall be subject to the express consent of the CIRCLE Association for International Cooperation and Development. While all information on this website has been compiled to the best of our knowledge and checked for correctness with the utmost care, mistakes or errors cannot be completely excluded. The website owner assumes no liability for the information contained therein being correct, complete or up-to-date. Despite the utmost care in checking content, the CIRCLE Association for International Cooperation and Development shall not be liable for the content of external links. Responsibility for the content of such links shall lie exclusively with their owners. All photographs have either been taken by Circle members or made available to Circle by third parties. Information pursuant to Art. 13 of Legislative Decree No. 196/2003 – Data Protection Code: We inform you that Legislative Decree No. 196 dated 30 June 2003 aims at the protection of personal data relating to individuals and other legal entities. According to said decree, all processing of personal data shall be in keeping with the principles of correctness, legality, transparency, confidentiality and the protection of personal rights.